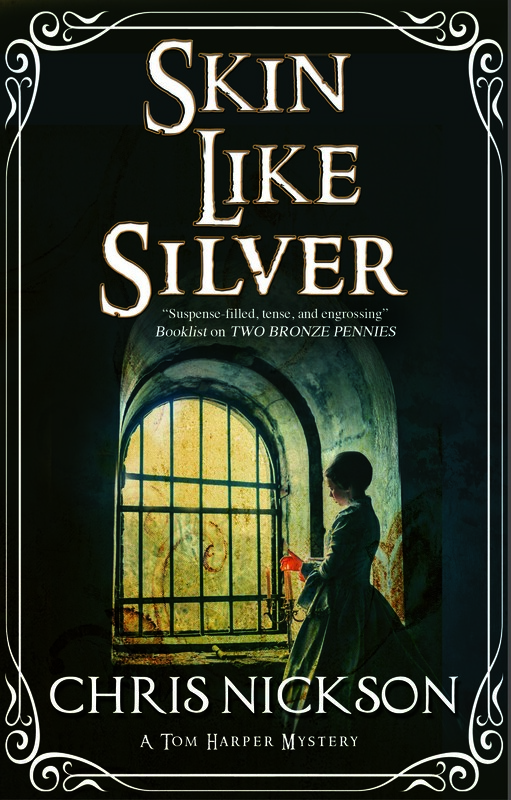 It’s actually a little over a month until the UK publication, and time to remind you about the release of Skin Like Silver, the third Tom Harper novel. I believe it’s the best, most complete novel I’ve ever written. It’s the kind of book I’ve been trying to write all along. Whether I’ve succeeded or not is a different matter, but I’m proud of what I’ve achieved in that, and I hope some of you will be eager to read it after having a taste of it. All the parts are in place. The launch has been set for Thursday, December 3, 6.30 pm at the Leeds Library, Commercial St., Leeds. There’s also going to be something very special at the event, a piece of true Victorian time travel. Seats are free but going very quickly. Reserve yours by calling the library on (0113)245 3071 or emailing them at enquiries@theleedslibrary.org.uk – and there will be wine. Tom Harper sat on the tram, willing it on to his stop and feeling foolish. As soon as it reached the bottom of Roundhay Road, he leapt off, scurried across the street hoping no one would spot him, then quickly disappeared through the door of the Victoria public house. He turned away to serve a customer. Why did his wife need him so urgently, Harper wondered testily. With a sigh, he slipped along the hallway and through the back door. Barrels and crates were stacked against the wall, by a brick shed that was secured with a rusty padlock. On the ground, flagstones jutted unevenly, a few ragged weeds showing between them. She was waiting, hands on hips, smiling as she saw him. She stood aside and he saw the photographer waiting patiently, his large camera resting on a tripod, the small developing cart behind him. He was beaten, and he knew it. She’d have her way in the end; she always did. Instead, he popped the top hat on his head and stood up straight. At least it would be over quickly, more than he could say for the rest of the day. It was the annual inspection of detectives, the time of year when they all had to turn up dressed like dogs’ dinners to be reviewed by the chief constable. A frock coat, striped trousers, the sharp points of a wing collar pushing tight into his neck, boots shined and glowing to within an inch of their lives. And the top hat. He couldn’t avoid it. It was part of the calendar for Leeds Police, the one day that the uniforms could laugh at them. Standing at attention in the yard behind Millgarth station, the ranks of them all waiting, everyone looking uncomfortable. Detective Inspector Tom Harper hated it. The only consolation was that he was at the end of the line. His right ear, where the hearing kept deteriorating, was towards the wall. He’d glanced over at Detective Constable Ash, turning out for his first parade, clothes new and stiff, the pride of promotion showing across his face. Harper removed the top hat again, the black silk brushing against his fingers. Annabelle kissed him. In the bedroom, he tossed them all over a chair and stretched, grateful for the freedom. He put on a comfortable shirt and old trousers, finally feeling like himself again, not some mannequin in a tailor’s shop window. Every October it was the same, come rain or today’s sunshine. A day wasted. He filled the kettle, putting it to heat on the range, and settled into a chair, glad that it was all done for another year. Tomorrow it was back to real work. He had a woman to find. It had begun the morning before, when Superintendent Kendall waved him into his office. The building stood at the bottom of Park Row, two grand stone storeys looking across to the railway stations. All day long, people crowded around the counters, waiting to send their letters and parcels. Upstairs, in the offices, things were more hushed. The chief clerk was a fussy man, standing erect, too conscious of his position. But his gaze kept sliding away to the small cardboard box on a side table, brown paper and string folded back around it. ‘I see, sir,’ Harper said. ‘I’ve never seen anything like it,’ the man continued. His hands began to fidget. Harper peered into the box. There was just a scrap of threadbare blanket left. Nothing else. The box was tiny. Small, he thought. God, the baby must have been so small. The parcel had been posted, but the delivery address didn’t exist, so it had been returned and placed on a shelf until the stink of decomposition became obvious. ‘Two days. I ordered that it be opened yesterday afternoon, and we discovered the body.’ He moved to the window and stared out, trying to hide the expression on his face. The details came slowly. It had been posted three days earlier from this building. The clerk had asked all the assistants: no one remembered the parcel, but why would they? They handled thousands every day. The body had been taken to the police pathologist. There was nothing more Harper could do here. He needed to go over to Hunslet. They all called it King’s Kingdom, the home of Dr King, the police surgeon whose mortuary lay in the cellar of Hunslet Lane police station. The smell of carbolic filled the air and rasped against his throat as he walked in. His footsteps echoed off the tiled walls. ‘Here about the baby?’ King asked. He had to be close to eighty, his hair pure white, a stained apron over a formal suit covered with the debris of this or that. But he was still deft in his work, his conclusions sharp and insightful. The surgeon peeled back the sheet from a small object. A naked baby, a boy, a cowl of dark hair on his scalp. He’d thought that, too. But she’d taken a devious route to hide it all. A servant, maybe, or someone who’d hidden the pregnancy in case she lost her position. He’d find out. It was a slow, sorrowful walk back across Crown Point Bridge into Leeds. All around, smoke rose from chimneys and the streets were noisy with the boom of manufacturing. He tried both the infirmary, but they’d had no women brought in with complications after childbirth. By the end of the day he had no idea how to find her. Now the annual inspection was over. Tomorrow he could begin the search again. Just as the tea finished mashing, she came up the stairs, the bright click of her heels on the wood. It was true. The image captured him perfectly, the jut of his chin, the stance, one leg forward, his deep-set eyes and sly smile. But those clothes… it wasn’t how he wanted anyone to remember him. ‘It’s good,’ he agreed mildly. He set out cups, sugar and milk, moving a book from the trivet to make room for the pot. The Condition of the Working Class in England, he saw on the spine. Not a novelette, he thought wryly. But none of the volumes that filled the place these days were. The change had begun in March. The new bakery in Burmantofts was doing so well that Annabelle had put Elizabeth, the manager, in charge of all three bakeries. They were thick as thieves, together two and three times a week for business that was also pleasure. The pub more or less ran itself, and without the other businesses to look after, Annabelle had an empty space in her life. Idleness wasn’t something that suited her. She’d started out as a servant in the pub before marrying the landlord, inheriting the place when he died, then opening her first bakery. She was wealthy now, but still never content unless she was busy at something, filling every waking hour to overflowing. He’d come home from a long day in the early spring rain to see her reading a pamphlet. Votes for Women, it said on the cover. ‘What?’ she asked sharply when she saw him staring. ‘I’m just surprised, that’s all,’ Harper told her. She’d never shown much interest in politics. The tale poured out, her eyes blazing. The old coalman had retired, and the new one had come that morning. When she complained about the quality of the coal, he rounded on her, telling her that maybe he’d do better dealing with her husband, then saying she needed someone who’d give her a good clout to keep her in line. She’d seen him off with a spade from the yard. Still seething, she’d taken a walk, barely noticing where she was going. Down by the market a woman had stopped her with a gentle touch on her arm. ‘They’re useless, the lot of them.’ The woman shook her head. ‘Here, you look like you need this,’ she said with a warm smile, handing Annabelle the pamphlet before vanishing back into the crowd. Within a fortnight she had books on all the tables, devouring each and every one. She began going to the suffragist meetings held in halls around Leeds, talking with other women, coming home glowing with excitement and possibilities for the future. But that was Annabelle, Harper thought. She never simply dipped her toe into something; she always had to immerse herself. She didn’t ignore the businesses. She still kept a close eye on them, totting up the accounts every week and making sure the money rolled in. ‘Are you sure you don’t mind?’ she asked one evening after she returned from another meeting. ‘Mind what?’ he asked, surprised. ‘I’m proud of you,’ he told her. He loved the way she could just fearlessly dive into something. And they still had their time together; she made sure of that. The evening slid by, warm enough to leave the window open. 1891 had been a strange year for weather. So much snow and bitter cold to start, then a blazing summer that still hadn’t withered as October began. It had been an odd year all round. He’d missed Billy Reed at the parade, and regret flowed through the inspector’s heart. They’d never resolved the resentment that seemed to hang between them at the start of 1891; they’d barely spoken in the last few months. Back from his injuries, the sergeant had quietly transferred to the fire brigade; it was part of the police force. The man had made his decision. He’d done what he believed he had to do. But it was a blow Harper had never expected. Billy had a sharp mind, and a clear, concise way of looking at things. More than that, Reed had been a friend, someone he’d always trusted completely. He knew it was his own fault. His insistence on a lie. But he couldn’t turn back time. At least Ash had come on quickly. He’d become an excellent detective, not afraid of hard work, observant, with a brain that was quick to find connections. In his own way he was just as good as Reed. But it could never be the same. The image of the dead baby slipped back into his mind again. Tomorrow, he thought. There was time for it then. The grandfather clock gave its chime for half past nine and he stood. She was gazing at the photograph, propped against the mantelpiece. ‘What are you thinking?’ he asked, placing a hand on her shoulder. He put his fingers over hers. ‘That sounds like a wonderful idea,’ he said. He’d been slowly stirring, still half-dozing, not wanting to move. Somewhere outside, beyond the open window, he could hear the first trills of the dawn chorus as the birds began to sing and chatter. Then the explosion. Louder than thunder, deeper, a dull sound that rippled and boomed. And then it was gone, leaving a sudden, dead silence that seemed to hang in the air. Harper sat up abruptly, looking at the clock. A little after half past four, still full darkness outside. ‘What was that?’ Annabelle’s voice was a sleepy mumble. Whetted your appetite? Want a little bit more? Then look here. The estranged wife of a wealthy industrialist, Catherine had been involved with the Leeds Suffragist Society, demanding votes for women, the same organization for which Harper’s wife, Annabelle, has just become a speaker. Were Catherine’s politics the cause of her death? Or is the husband she abandoned behind it? But when her brother escapes from the asylum and steals a shotgun, Harper has to race to find the answers. Order your copy here – this is by far the cheapest price around.